4-inch Power Claw: The creature bait, a craze that just won?t die, continues as an angler?s favorite. Berkley stirs the creature baitpot with the new PowerBait Power Claw. 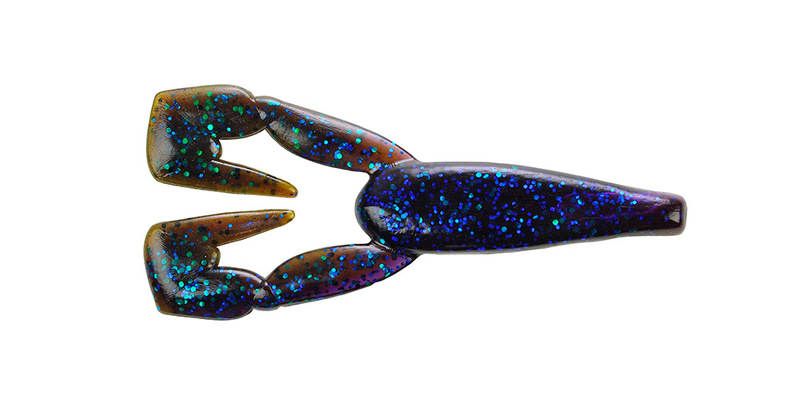 This 4-inch soft plastic, with claws that simply cannot be still, is designed to catch fish, and can be used in a variety of techniques throughout the seasons.The overall body design of the Power Claw makes this creature bait worth a second look. With a segmented body and appendages, the Power Claw maximizes the erratic motion of the two, high-action pinchers, enticing more strikes. For the best results, use the lifelike bait where bass are holding tight to cover. Fishing the bait with a weighted belly-hook or as a jig trailer. The Power Claw is perfect for any waters.The Power Claw is packed with the Berkley PowerBait advantage. Fish hold on 18 times longer giving any angler a distinct advantage for greater success and more time for hook sets.Berkley PowerBait Power Claw are available in 10 attractive colors; Bama Bug, Black, Black Blue Fleck, Green Pumpkin, Green Pumpkin Red Blue, Green Pumpkin Red Pearl, Pumpkin Chartreuse and Watermelon Big Red. A package of six Berkley PowerBait 4-inch Power Claw has an MSRP of $4.29. 4-inch Thief: The new Berkley PowerBait 4-inch Thief is the latest in innovative soft bait designs created by the Berkley design team. The versatile bait can be rigged and presented to fit a wide range of applications and conditions.The PowerBait Thief utilizes its high-action tentacles and pinchers to give the bait extreme movement and plenty of water disturbance. The broad body allows the Thief to maneuver through heavy cover and dense forage.Simply rig Texas style or on a Carolina rig for the slow presentations in structure or along the bottom. For a subtle approach to catch finicky fish use as a jig head trailer. The Thief can even be rigged weightless for fishing grass or along or near the surface. ?To Texas rig the Thief use a 3/8-ounce bullet weight with a 3/0 wide-gap hook and target heavy cover,? said Lane. ?Take the weight off and run the Thief as a top water bait through grass and stump fields. The Thief makes a great all-around bait that is easy to rig and easier to fish. Cast the Thief out, bounce it along the bottom or swim it through thick areas, the PowerBait Thief is ideal for any condition presented. ?Available in 10 fish-catching colors; Bama Bug, Big Texan, Black Blue Fleck, Black Red Fleck, Breen Orange Fleck, Green Pumpkin, Green Pumpkin Red Fleck, Summer Craw, Watermelon and Watermelon Big Red. MSRP for this new finesse bait is $4.29 per package, which contains six PowerBait Thiefs. 3-inch Twitchtail Minnow: Having versatile bait in your tackle box is key to being a successful angler. Whether on a drop shot rig or on a jig head, the new Berkley PowerBait 3-inch Twitchtail Minnow lands big bass or walleye.The true action of any bait rests in its tail. The Twitchtail Minnow offers a tail that moves with little to no current, making it ideal for pressured fish.The PowerBait Twitchtail Minnow sports a new tail design, allowing for enhanced bait movement. The best way to describe the tail is to picture a narrowed tail with no split. The body tapers down to the straight-line tail that delivers unmatched action when finesse fishing.A flattened back and ever-slight bulge in the belly make the Twitchtail a great choice for a day of light-line techniques. Infused with the exclusive PowerBait formula, fish will bite and hold on 18-times longer than other scented baits.Available in 15 colors: Chartreuse Black Fleck-Orange, Black Shad, Breen-Clear Chartreuse, Chartreuse Shad, clear Golden Shiner, Clear Bluegill, Clear Gold-Black Back, Clear Silver Shiner, Clear Smelt, Green Pumpkin, Pearl Watermelon Shad, Pearl White, Perch, Pink-Pearl and Smelt.PowerBait 3-inch Twitchtail Minnow is available in packages of 12 and has a MSRP of $4.29. 3/4-inch Atomic Wishbine and Atomic Dogbone:Anglers looking to expand their trout and panfish tactics will gain an advantage with the new Berkley PowerBait 3/4-inch Atomic Wishbone and Atomic Dogbone. Mimicking the hatched mayfly, the unique shapes and tail designs are irresistible to fish.The 3/4-inch Atomic Wishbone and Atomic Dogbone are versatile enough to use with a fly rod or dangle under a bobber. The high-action tails entice even the finicky fish to bite.Rigged on a jig, anglers can target shallow waters to capitalize on the small, fluttering tail of the Atomic Wishbone or Atomic Dogbone. Anglers are encouraged to tie either bait using the Trilene knot.Each bait has been infused with the exclusive PowerBait formula to keep fish hanging on 18 times longer than other scented baits.The 3/4-inch Atomic Wishbone and Atomic Dogbone come in three different weights to maximize your opportunities for bigger and better fish. The baits are available in 1/32, 1/64, 1/80 ounce sizes and come with eight baits per package. All three sizes have a MRSP of $3.49.Available in six colors: Black, Clear Silver Fleck, Glow White, Pink, Pumpkinseed and Red.